01. The objective of this Standard is to prescribe guidelines on general considerations and policies for the preparation and presentation of financial statements setting out the purposes, requirements and principles on and the structure and basis contents of the financial statements. 02. This Standard should be applied in the presentation of financial statements prepared and presented in accordance with Vietnamese Accounting Standards. 03. This Standard applies to the financial statements of an individual enterprise and to the consolidated financial statements for a group of enterprises. This Standard also applies to condensed interim financial information. 04. This Standard applies to all types of enterprises. Additional requirements for banks, credit institutions and financial institutions are set out in Standard “Disclosures in the Financial Statements of Banks and Similar Financial Institutions”. This information, along with other information in the notes to financial statements, assists users in predicting the enterprise’s future cash flows and in particular the timing and certainty of the generation of cash and cash equivalents. 06. The director (or leader) of an enterprise is responsible for the preparation and presentation of its financial statements. (d) Notes to the financial statements. 08. Enterprises are encouraged to present, outside the financial statements, a review by management which describes and explains the main features of the enterprise’s financial performance and financial position and the principal uncertainties it faces if management believes they will assist users in making economic decisions. 09. Financial statements should present fairly the financial position, financial performance and cash flows of an enterprise. To achieve a fair presentation, financial statements should be prepared and presented in compliance with prevailing accounting standards, accounting policies and related regulations. 10. An enterprise whose financial statements comply with Vietnamese accounting standards and accounting policies should disclose that fact in the notes to the financial statements. 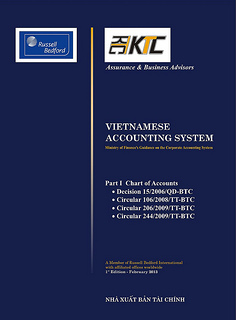 Financial statements should not be described as complying with Vietnamese accounting standards and accounting policies unless they comply with all the requirements of each applicable standard and policy and each applicable regulations of the Ministry of Finance guiding the implementation of the Vietnamese Accounting Standards. In case that an enterprise applies accounting policies which are not in accordance with Vietnamese accounting standards and accounting policies, it is not then considered as complying with prevailing accounting standards even though it is fully disclosed in the Notes to the financial statements. (c) providing additional disclosures when the requirements in Vietnamese Accounting Standards are insufficient to enable users to understand the impact of particular transactions or events on the enterprise’s financial position and financial performance. are complete in all material respects. 13. Accounting policies are the specific principles, bases, conventions, rules and practices adopted by an enterprise in preparing and presenting financial statements. (c) Particular regulations of the industry which are accepted only to the extent that they are consistent with (a) and (b) of this paragraph. 15. When preparing financial statements, the Director (or leader) of an enterprise should make an assessment of the enterprise’s ability to continue as a going concern. Financial statements should be prepared on a going concern basis unless the enterprise either intends to liquidate the enterprise or to cease trading, or has no realistic alternative but to do so. When the Director (or leader) of the enterprise is aware, in making its assessment, of material uncertainties related to events or conditions which may cast significant doubt upon the enterprise’s ability to continue as a going concern, those uncertainties should be disclosed. When the financial statements are not prepared on a going concern basis, that fact should be disclosed, together with the basis on which the financial statements are prepared and the reason why the enterprise is not considered to be a going concern. 16. In assessing whether the going concern assumption is appropriate, the Director (or leader) of an enterprise takes into account all available information for the foreseeable future, which should be at least twelve months from the balance sheet date. 17. An enterprise should prepare its financial statements, except for cash flow information, under the accrual basis of accounting. 18. Under the accrual basis of accounting, transactions and events are recognised when they occur and not as cash or its equivalent is received or paid; and they are recorded in the accounting records and reported in the financial statements of the periods to which they relate. Expenses are recognised in the income statement on the basis of a direct association between the costs incurred and the earning of specific items of income (matching). However, the application of the matching concept does not allow the recognition of items in the balance sheet which do not meet the definition of assets or liabilities. 20. A significant acquisition or disposal, or a review of the financial statement presentation, might suggest that the financial statements should be presented differently. Only if the revised structure is likely to continue, or if the benefit of an alternative presentation is clear, should an enterprise change the presentation of its financial statements. When such changes in presentation are made, an enterprise reclassifies its comparative information in accordance with paragraph 30 and discloses the reasons for changes together with the impacts on the financial statements in the accompanying notes. 21. Each material item should be presented separately in the financial statements. Immaterial amounts should be aggregated with amounts of a similar nature or function and need not be presented separately. 22. In presenting financial statements, information is material if its non-disclosure or improper presentation could cause material misstatements and influence the economic decisions of users taken on the basis of the financial statements. Materiality depends on the size and nature of the item judged in the particular circumstances of its omission. In deciding whether an item or an aggregate of items is material, the nature and the size of the item are evaluated together. Depending on the circumstances, either the nature or the size of the item could be the determining factor. For example, individual assets with the same nature and function are aggregated even if the individual amounts are large. However, large items which differ in nature or function are presented separately. 23. If an item is not individually material, it is aggregated with other items either on the face of the financial statements or in the notes to the financial statements. An item that is not sufficiently material to warrant separate presentation on the face of the financial statements may nevertheless be sufficiently material that it should be presented separately in the notes to the financial statements. 24. Materiality provides that the specific disclosure requirements of accounting standards need not be met if the resulting information is not material. 25. Assets and liabilities should not be offset except when offsetting is required or permitted by another accounting standard. (b) gains, losses and related expenses arising from the same or similar transactions and events are not material. Such amounts should be aggregated in accordance with paragraph 21. 27. It is important that assets and liabilities, and income and expenses, when material, are reported separately. Offsetting in either the income statement or the balance sheet, except when offsetting reflects the substance of the transaction or event, detracts from the ability of users to understand the transactions undertaken and to assess the future cash flows of the enterprise. 29. Gains and losses arising from a group of similar transactions are reported on a net basis, for example foreign exchange gains and losses or gains and losses arising on financial instruments held for trading purposes. Such gains and losses are, however, reported separately if their size, nature or incidence is such that separate disclosure is required by Accounting Standard “Net Profit or Loss for the Period, Fundamental Errors and Changes in Accounting Policies”. 30. Comparative numerical information should be disclosed in respect of the previous period for all numerical information in the financial statements. Comparative information should be included in narrative and descriptive information when it is relevant to an understanding of the current period’s financial statements. 31. When the presentation or classification of items in the financial statements is amended, comparative amounts should be reclassified (unless it is impracticable to do so) to ensure comparability with the current period, and the nature, amount of, and reason for, any reclassification should be disclosed. When it is impracticable to reclassify comparative amounts, an enterprise should disclose the reason for not reclassifying and the nature of the changes that would have been made if amounts were reclassified. 32. Circumstances may exist when it is impracticable to reclassify comparative information to achieve comparability with the current period. For example, data may not have been collected in the previous periods in a way which allows reclassification, and it may not be practicable to recreate the information. In such circumstances, the nature of the adjustments to comparative amounts that would have been made is disclosed. Accounting Standard “Net Profit or Loss for the Period, Fundamental Errors and Changes in Accounting Policies” deals with the adjustments required to comparative information following a change in accounting policy that is applied retrospectively. 34. The requirements in paragraph 33 are presented in the financial statements. Depending on the circumstances, judgement is required in determining the best way of presenting such information. In case the financial statements are read electronically, separate pages may not be used; the above items are then presented frequently enough to ensure a proper understanding of the information given. (b) the fact that comparative amounts for the income statement, cash flows statement and related notes to the financial statements are not comparable to those of the current period. 36. In exceptional circumstances an enterprise may be required to, or decide to, change its balance sheet date, for example following the acquisition of the enterprise by another enterprise with a different balance sheet date. In this is the case, the current period figures and the comparative amounts are not comparable, and the reason for the change of the balance sheet date is disclosed by the enterprise. 37. Each enterprise should present current and non-current assets and current and non-current liabilities as separate classifications on the face of the balance sheet. When an enterprise is unable to make this classification due to the nature of its operation, assets and liabilities should be presented descending in order of their liquidity. 38. Whichever method of presentation is adopted, an enterprise should disclose, for each asset and liability item that combines amounts expected to be recovered or settled both before and after twelve months from the balance sheet date, the amount expected to be recovered or settled after more than twelve months. 39. When an enterprise supplies goods or services within a clearly identifiable operating cycle, separate classification of current and non-current assets and liabilities on the face of the balance sheet provides useful information by distinguishing the net assets that are continuously circulating as working capital from those used in the enterprise’s long-term operations. It also highlights assets that are expected to be realised within the current operating cycle, and liabilities that are due for settlement within the same period. (c) is cash or a cash equivalent asset which is not restricted in its use. 41. All other assets should be classified as non-current assets. 42. Non-current assets include tangible, intangible, financial assets of a long-term nature and other non-current assets. 43. The operating cycle of an enterprise is the time between the acquisition of materials entering into a process and its realisation in cash or an instrument that is readily convertible into cash. Current assets include inventories and trade receivables that are sold, consumed and realised as part of the normal operating cycle even when they are not expected to be realised within twelve months of the balance sheet date. Marketable securities are classified as current assets if they are expected to be realised within twelve months of the balance sheet date; otherwise they are classified as non-current assets. (b) is due to be settled within twelve months of the balance sheet date. 45. All other liabilities should be classified as non-current liabilities. 46. Current liabilities can be categorised in a similar way to current assets. Some current liabilities, such as trade payables and accruals for employee and other operating costs, form part of the working capital used in the normal operating cycle of the business. Such operating items are classified as current liabilities even if they are due to be settled after more than twelve months from the balance sheet date. 47. Other current liabilities are not settled as part of the current operating cycle, but are due for settlement within twelve months of the balance sheet date. Examples are the current portion of interest-bearing liabilities, bank overdrafts, taxes and other non-trade payables. Interest-bearing liabilities that provide the financing for working capital on a long-term basis, and are not due for settlement within twelve months, are non-current liabilities. (b) the enterprise intends to refinance the obligation on a long-term basis and that intention is supported by an agreement to refinance, or to reschedule payments, which is completed before the financial statements are authorised for issue. The amount of any liability that has been excluded from current liabilities in accordance with this paragraph, together with information in support of this presentation, should be disclosed in the notes to the balance sheet. 49. Some obligations that are due to be repaid within the next operating cycle may be expected to be refinanced or ‘rolled over’ at the discretion of the enterprise and, therefore, are not expected to use current working capital of the enterprise. Such obligations are considered to form part of the enterprise’s long-term financing and should be classified as non-current. However, in situations in which refinancing is not at the discretion of the enterprise (as would be the case if there were no agreement to refinance), the obligation is classified as current unless the completion of a refinancing agreement before the authorisation of the financial statements for issue provides evidence that the substance of the liability at the balance sheet date was long-term. (b) it is not probable that further breaches will occur within twelve months of the balance sheet date. 52. Additional line items, headings and sub-totals should be presented on the face of the balance sheet when an accounting standard requires it, or when such presentation is necessary to present fairly the enterprise’s financial position. (b) the descriptions used and the ordering of items may be amended according to the nature of the enterprise and its transactions, to provide information that is necessary for an overall understanding of the enterprise’s financial position. For example, for a bank or a similar financial institution, the presentation of the balance sheet will be more specifically prescribed in paragraphs Accounting Standard “Disclosures in the Financial Statements of Banks and Similar Financial Institutions”. 54. An enterprise should disclose, either on the face of the balance sheet or in the notes to the balance sheet, further sub-classifications of the line items presented, classified in a manner appropriate to the enterprise’s operations. Each item should be sub-classified, when appropriate, by its nature and, amounts payable to and receivable from the parent enterprise, fellow subsidiaries and associates and other related parties should be disclosed separately. (a) tangible fixed assets are classified as described in VAS 03 “Tangible fixed assets” into Buildings, structures; Machinery and equipments; Means of transportation, and transmission; Management tools and devices; Perennial trees, working and/or product animals; Other tangible fixed assets. (e) equity capital and reserves from profits are analysed showing separately the various classes of paid – in capital, share premium and reserves. 17. Net profit/loss for the period. 57. Additional line items, headings and sub-totals should be presented on the face of the income statement when required by another Vietnamese Accounting Standard, or when such presentation is necessary to present fairly the enterprise’s financial performance. 58. Descriptions used and the ordering of items are amended when this is necessary to explain the elements of performance. Factors to be taken into consideration include materiality and the nature and function of the various components of income and expenses. For example, for a bank or a similar financial institution, the presentation of the balance sheet will be more specifically prescribed in Accounting Standard “Disclosures in the Financial Statements of Banks and Similar Financial Institutions”. 59. If, due to the operation nature of an enterprise, items on the face of the income statement could not be presented based on the function of expenses, they will be presented based on the nature of expenses. Information to be presented either on the face of the Income statement or in the Notes to the Financial statements. 60. Enterprises classifying expenses by function should disclose additional information on the nature of expenses, for example, depreciation and amortisation expenses and staff costs. 61. An enterprise should disclose in the notes the amount of dividends per share, declared or proposed, for the period covered by the financial statements. 62. Cash flow statement is prepared and presented in accordance with the requirements set out in VAS 24 “Cash flow statement”. (c) provide additional information which is not presented on the face of the financial statements but that is necessary for a fair presentation. 64. Notes to the financial statements should be presented in a systematic manner. Each item on the face of the balance sheet, income statement and cash flow statement should be cross-referenced to any related information in the notes. 65. Notes to the financial statements include narrative descriptions or more detailed analyses of amounts shown on the face of the balance sheet, income statement, cash flow statement, as well as additional information. They include information required to be disclosed by others accounting standards, and other disclosures necessary to achieve a fair presentation. (b) each specific accounting policy that is necessary for a proper understanding of the financial statements. 68. In addition to the specific accounting policies used in the financial statements, it is important for users to be aware of the measurement basis (bases) used (historical cost, current cost, realisable value, fair value or present value) because they form the basis on which the whole of the financial statements are prepared. When more than one measurement basis is used in the financial statements, for example when certain assets are revalued as required by statutes, it is sufficient to provide an indication of the categories of assets and liabilities to which each measurement basis is applied. Other accounting standards specifically require disclosure of accounting policies in many of these areas. 70. Each enterprise considers the nature of its operations and the policies which the user would expect to be disclosed for that type of enterprise. When an enterprise has significant foreign operations or transactions in foreign currencies, disclosure of accounting policies for the recognition of foreign exchange gains and losses and the hedging of such gains and losses would be expected. In consolidated financial statements, the policy used for determining goodwill and minority interest is disclosed. 71. An accounting policy may be significant even if amounts shown for current and prior periods are not material. It is also appropriate to disclose an accounting policy for each policy not covered by existing Vietnamese Accounting Standards, but selected and applied in accordance with paragraph 12. (c) the cumulative effect of changes in accounting policy and the correction of fundamental errors dealt with under the accounting treatments in Accounting Standard “Net Profit or Loss for the Period, Fundamental Errors and Changes in Accounting Policies”. (f) a reconciliation between the carrying amount of each class of equity capital, share premium and each reserve at the beginning and the end of the period, separately disclosing each movement. (d) the amount of any cumulative preference dividends not recognised. An enterprise without share capital, such as a partnership, a state-owned enterprise or a limited liability company should disclose information equivalent to that required above, showing movements during the period in each category of equity interest and the rights, preferences and restrictions attaching to each category of equity interest. (d) either the number of employees at the end of the period or the average for the period.